Recently, Starting Trends was granted an exclusive interview with the CEO of JOI Media, Brock Murray, to discuss the creation and launch of Katipult, a fully developed and customizable white-label crowdfunding platform. The team at Starting Trends would like to personally thank Brock for taking the time out of his busy schedule to speak with us. We hope you enjoy the interview and please feel free to comment below on the Katipult white-label crowdfunding platform. Please tell us a bit about yourself including some of your background as well as your current role with JOI Media/Katipult. As a Finance graduate, I spend a considerable amount of time working in capital markets as an Analyst for an equity research firm. I eventually decided to pursue more entrepreneurial ventures and directed my focus on JOI Media, a software development company. I am currently the Chief Executive Officer and I have the pleasure of working alongside a great leadership team to provide software solutions such as Katipult to our clients. Please describe your Katipult software and tell us a bit about what it does. Katipult is a white-label crowdfunding platform, meaning it is a fully developed turn-key solution for organizations looking to enter this market. Our product has all the necessary crowdfunding features ready-made and it can be customized to meet additional needs of any organization. What was the main spark that inspired your team to create and launch Katipult.com? Our team was introduced to the crowdfunding concept in 2008 when the major platforms of today, (Kickstarter, Indiegogo, Kiva). were in their infancy. We saw potential in the transparency and donor engagement aspects for charitable projects. We originally financed the development of Katipult as a community initiative, however when our client base expressed interest in owning their own company-branded crowdfunding platforms, we added the system to our software product line. What separates your white label software from others that are available in the crowdfunding industry? Katipult is a unique solution in that we offer on-premise deployment of our software through our software license agreement. We offer our clients ownership of a single, perpetual license which gives them full control over their product including hosting, maintenance, and upgrades. Katipult is a product of JOI Media, a software development firm with a long track record and great client list. Both of these aspects are very important to the stakeholders in our target segment. How much time & planning went into creating your software? The research and development on a software product never stops. Technologies keep changing and new Internet trends arrive: i.e., Social Media. We started planning development for Katipult in 2008 so we’ve been at it for a while. What advice, (if any). would you personally give to those who are considering launching their own donation, reward and/or equity based funding portal in Canada or anywhere for that matter? It’s hard to give general advice because it really depends who the management team or organization launching the platform is, but I would advise those looking to launch a funding portal to ensure they have a sustainable business model. For example, solely taking a percentage of funds raised from projects is a model I don’t believe is sustainable. In your opinion, at this point how educated do you think fellow Canadians are overall when it comes to equity crowdfunding & crowdfunding in general? I think crowdfunding is a relatively new term for fellow Canadians just like “social media” was a few years ago. 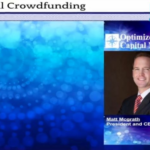 That being said, the concept of crowdfunding isn’t new at all when it comes to capital markets and publicly traded companies. Equity crowdfunding is more complex so it requires organizations like the National Crowdfunding Association of Canada to educate and create awareness.